With some better reports coming in from along some parts of the Space Coast, I thought it might be a good time to return to Turkey Creek Sanctuary. The better forecast for migrants is for later in the week, but the winds have been out of the south for the past few days, making for at least some marginally good conditions. I met up with Camille again and we set out along the Sand Pine Trail on our way to the boardwalk where there are generally reliable sightings. 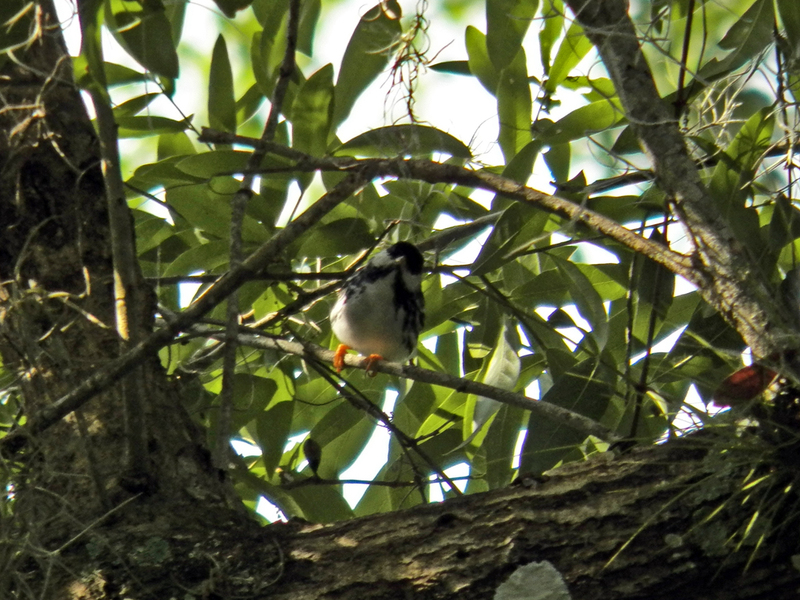 Aside from the usual Northern Cardinals and Carolina Wrens singing up a storm, we did encounter a decent sized, mixed flock of Black-and-white Warblers and Blackpoll Warblers, mostly high in the pine trees. Since different warbler species often associate with each other, we gave this group a really good look to make sure we weren’t missing any other species before moving on down the trail. The flock more-or-less followed us along the trail, but we didn’t see much else. I could hear Chimney Swifts above us, but never got a good look, and there were Blue-gray Gnatcatchers nearby as well. We got to the boardwalk to an area where Camille (who had run into Bill Haddad last week) had seen some warblers, and is known to be a pretty good hot-spot. At first we didn’t see to much, but then we heard some gnatcatchers (often a preamble to warbler or vireo activity). Sure enough, we wound up with a nice group of Blackpolls, Black-and-Whites, American Redstarts, and even a Black-throated Blue Warbler! This Black-and-white Warbler was hanging around with some Blackpoll Warblers. Sometimes it can be hard to distinguish the Blackpolls (especially the females) from some other species when the birds are in the canopy or in poor light (most of the birds we saw were very backlit). 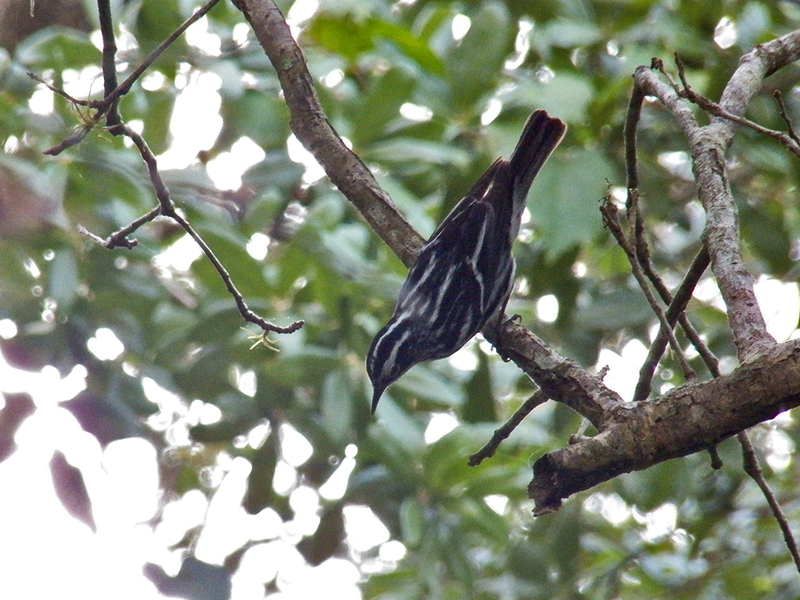 A key identifier for Blackpoll Warblers is their orange feet. Female Blackpoll Warblers lack the dashing black cap (or “blackpoll”) of the male, but they have a pretty olive-yellow tint and subtle streaking. Again, those orange feet are a good field mark to differentiate the females from other, similarly colored birds. Prominent wing-bars are also a great field-mark for Blackpolls. Most of these birds were engaged in three types of foraging: creeping, gleaning, and flycatching. 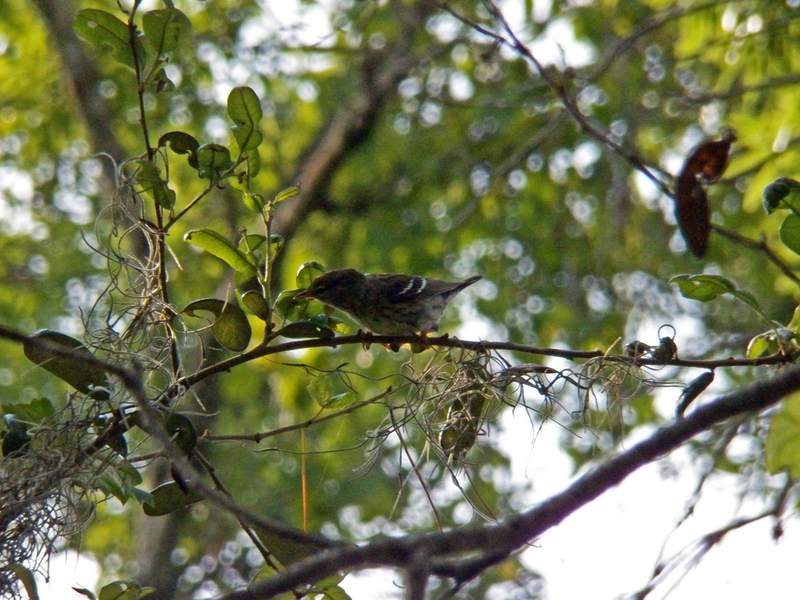 Creeping is when birds walk along the bark of a tree trunk or limb, grabbing small invertebrates as they move along. When birds hop or walk from branch to branch or on twing, reaching up or across to grab food, that is gleaning. Flycatching, of course, is what just what it says: the bird will dash out from a perch to grab a flying insect from mid-air, often performing stunning aerial acrobatics to do so. Along with our “monochromatic” friends (being mostly black and white), this flock of birds had a fair amount of American Redstarts among them. Redstarts are fun birds. The males are strikingly black and orange colored and they constantly flutter about, drooping their wings and fanning their tails. They will often drop off a branch and flit down, like a falling leaf, only to swoop back up and start again. The females are just as active as the males, though their colors are a little more muted (olive-brown and yellow). 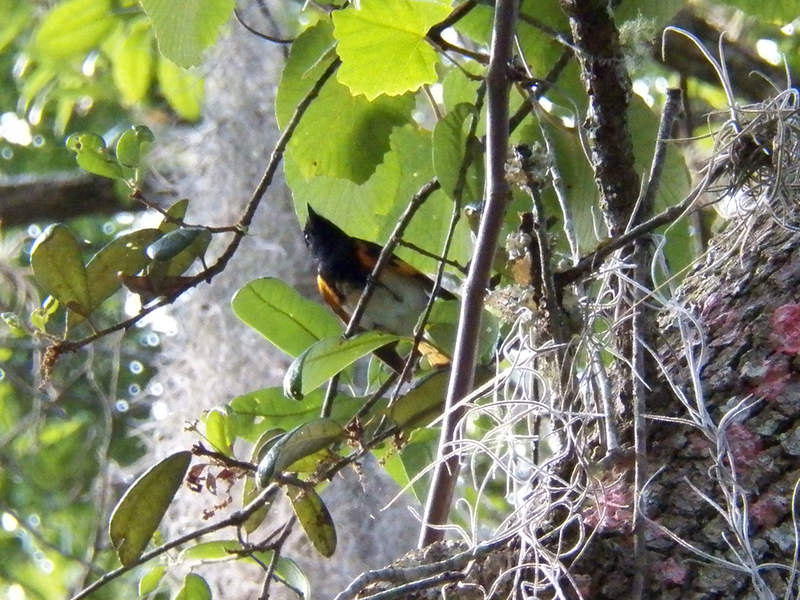 Fast and furious, it’s hard to get a good shot of an American Redstart. The overall effect of these three species moving through the canopy was one of almost dizzying chaos. It was hard to know where to center the eyes, binoculars, or camera. There was at least one Black-throated Blue Warbler among them, but it was hard to know if any more were in the melee of feathers. It was fairly quiet further along the boardwalk and onto McKinnon’s Way. We would hear some high-pitched calls here and there, but it was difficult to see much in the canopy. I got a glimpse of a Blue-gray Gnatcatcher, and we picked out a few more Blackpolls, but that was mostly it, until we got to the weir. First, I had a look at the “emergency” boat ramp. If you remember from last time at Turkey Creek, the high waters had likely removed the ramp’s deck (which was a bit rotted anyway). 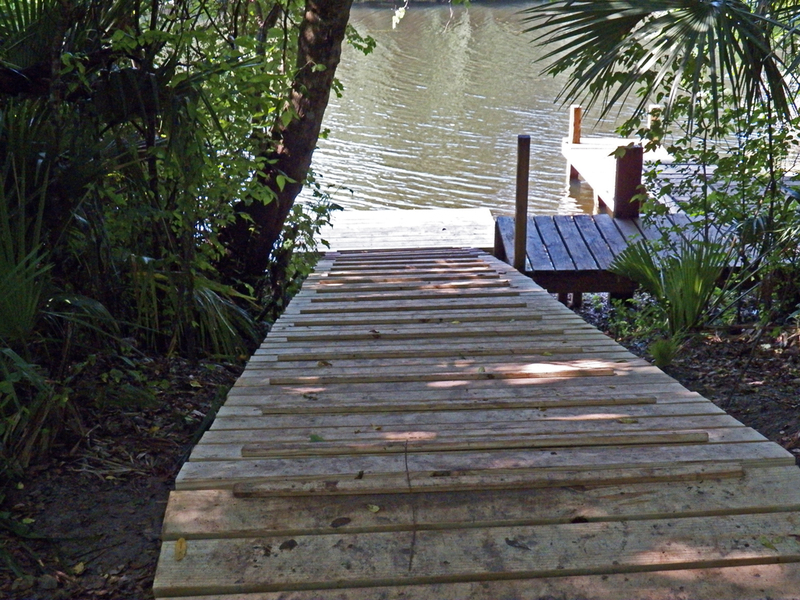 Repairs have been made, and there’s even a new platform at the base of the ramp. As we came out of the woods, we saw some movement along the trail up ahead. 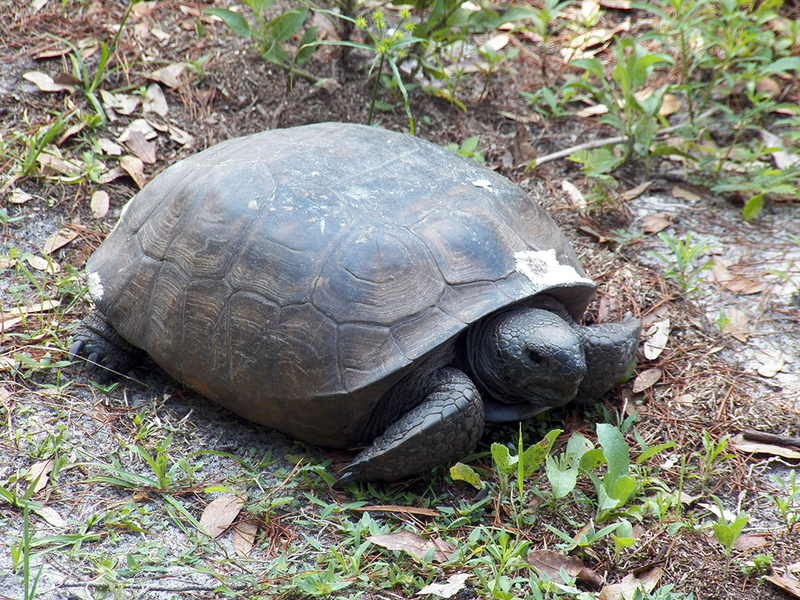 There was an overturned Gopher Tortoise! I quickly walked up and turned it upright. It didn’t hiss all that much and walked on its way. It was a real topsy-turvey day for this tortoise! There was a larger tortoise further down the path, and Camille wondered if maybe they had a tussle or mating encounter that went awry (at least for the first turtle). I actually recognized the second tortoise from it’s shell markings and size, which was kind of cool. 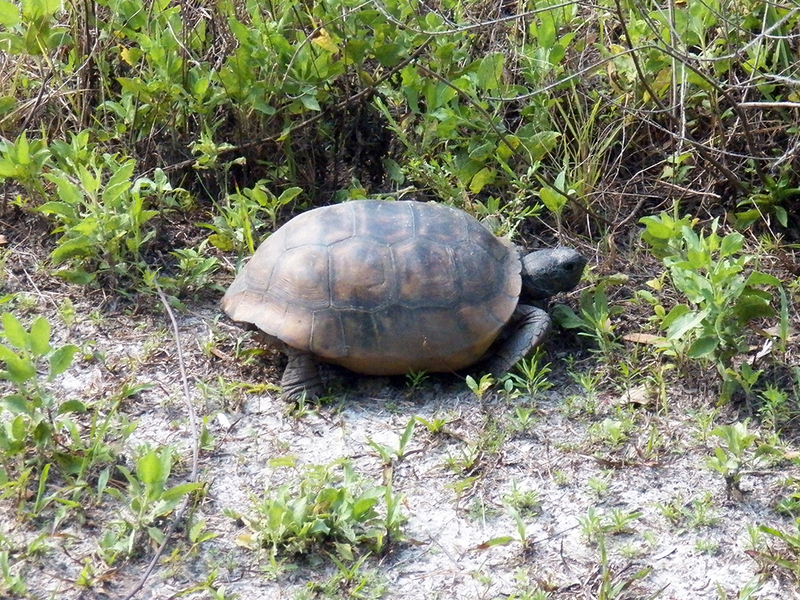 This tortoise was much more grumpy and hissed a lot before lumbering on its way. At the weir there were 2 spillways open, since the water was still somewhat low on the canal side. At first the area behind the orange float barrier seemed completely bird-free, but upon closer inspection there was a single Killdeer, one Green Heron, and then a lovely surprise. A pair of Solitary Sandpipers! This was another life bird for Camille, and a first of the year for me. I’ve actually encountered this species before, along the trail leading to McKinnon’s Way from the boardwalk. It was odd that they were so far into the wooded trail area, and i don’t know if this is the same pair or not. 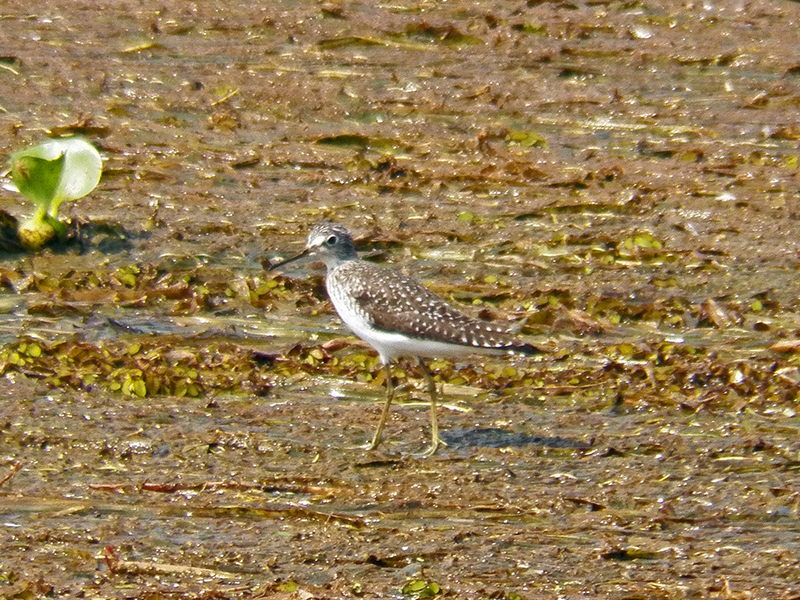 One of two Solitary Sandpipers walking in the muck. With the day wearing on and the heat climbing, it was about time to wrap things up. We walked back up the western side of the Sanctuary, past the Scrub Trail, to where there are sometimes Indigo Buntings or vireos, but it was really quiet. We had one more look at some Blackpoll Warblers before heading on toward the Picnic Pavilion and then out. The weather forecast calls for potential fall-out inducing conditions early this week, but not so much for the coming weekend, so we’ll see how that pans out. Posted on 2015 April 27 2015 April 27 by Lonely BirderPosted in BirdingTagged Birding, birds, Camille, Turkey Creek Sanctuary.